To say that Tokyo is vast would be a major understatement. The Japanese capital is one of the largest in the world both by land area and population, something that becomes evident pretty overwhelmingly when you see it from above. From the observation deck of the Tokyo SkyTree, the city appears to be sprawling, stretching its concrete arms to the horizon in all directions. We’ve visited multiple times before, and yet there are still so many parts of the city that we have yet to explore. Thankfully, Tokyo is also home to one of the world’s most expansive and most impressive subway networks, operating in true Japanese fashion: efficient, organized, and on time. No matter how huge or how intricate Tokyo is, getting around doesn’t need to be stressful. As long as there’s a train station close to your destination — and there usually is — it’s never really that far. Tokyo’s extensive train system is controlled by over a dozen operators, but in this itinerary, we will only be using the subway lines and the tram line which is very rare in the city. The subway lines are operated by Toei Transportation and Tokyo Metro. 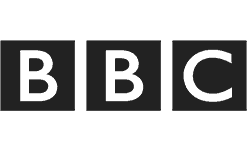 Although separate entities, these two work in great synergy. Each of them operate multiple lines that are so connected to each other, it’s amazing how the Japanese make it work and they do it like clockwork. Often, you don’t need to exit the gates and buy new tickets even if you switch from Toei Subway line to Tokyo Metro line. (There are cases when you do, though.) Subway lines are marked with an assigned letter in a color-coded circle. For example, the Toei Oedo Line’s mark is an E in a magenta circle, while the Toei Asakusa Line’s mark is a the letter A in a rose pink circle. Remember these marks and the companies’ logos because this is how you’ll find them. 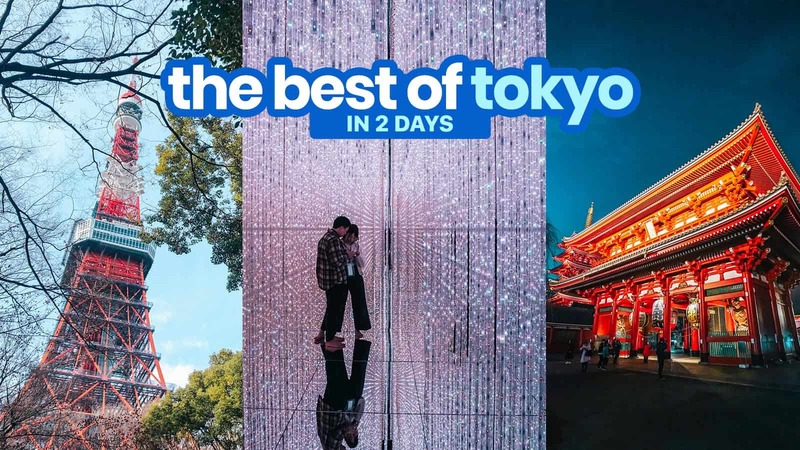 We’ve just arrived from another Tokyo trip, but this time, we challenged ourselves if we would be able to see in two days the city’s key attractions including the usual crowd favorites and those off the beaten path using only the subway and the tram. After the trip, we were able to come up with this 2-day itinerary, which is perfect for first-timers who wish to see the best that the city has to offer but in a limited time. 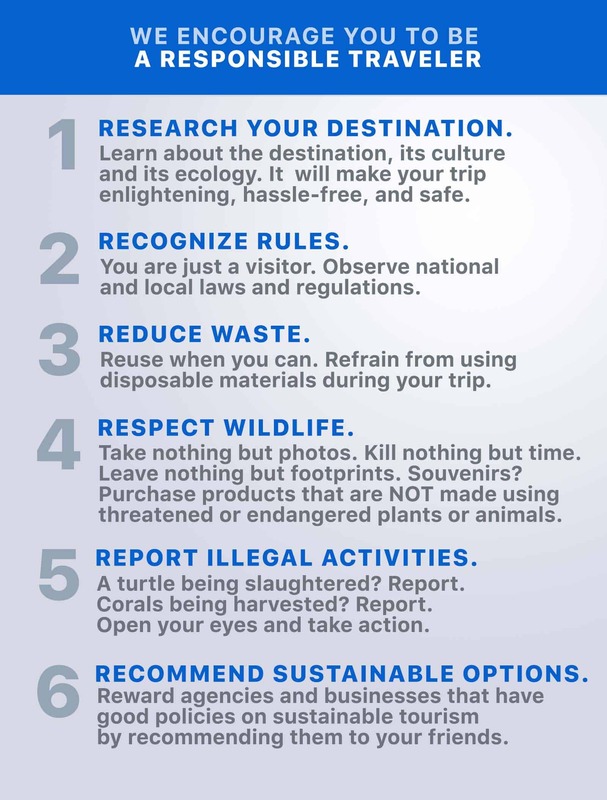 If you’re staying for more days, you can also use this as part of a bigger itinerary. 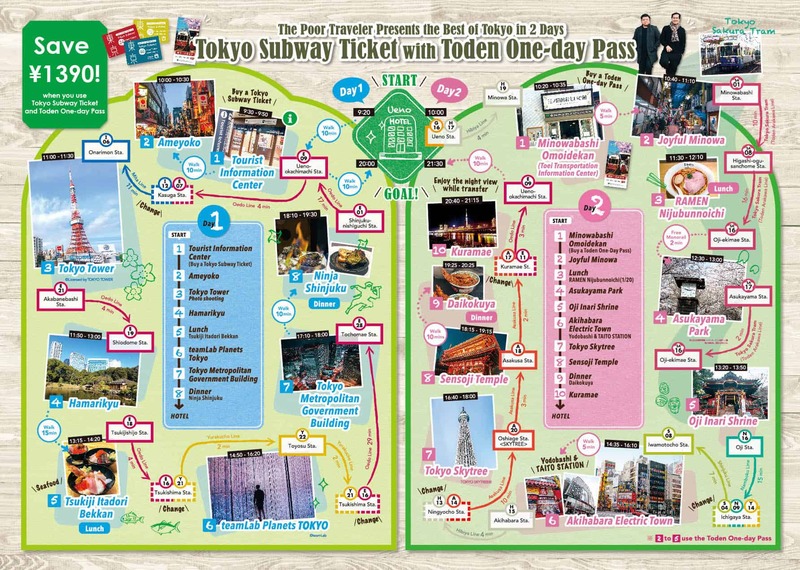 For the first day’s itinerary, you will be using the Toei Oedo Line a lot. 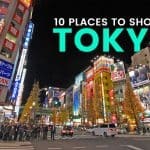 This subway line is particularly useful for visitors because it connects many of the most popular tourist spots in Tokyo including the Tokyo Tower, Shinjuku, Yoyogi, and Roppongi. But of course, we’ll also use other subway lines. 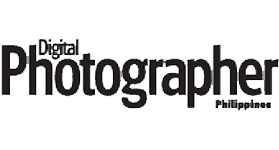 It’s available at Haneda Airport, Narita Airport, and select hotels, Bic Camera branches, and Tourist Information Centers (more about that later) all around Tokyo. You can also purchase online via Klook. You will need to present your passport because it’s available only for tourists. The great thing about the Tokyo Subway Ticket is: You don’t need to fall in line to buy a ticket each time you’re taking the subway. So not only do you save money, you also save a lot of time! Very convenient. Because this is a 2-day itinerary, we’ll be using the 48-hour ticket. Before you get the party started, it’s always a good idea to start your day with a stop at the Information Center. 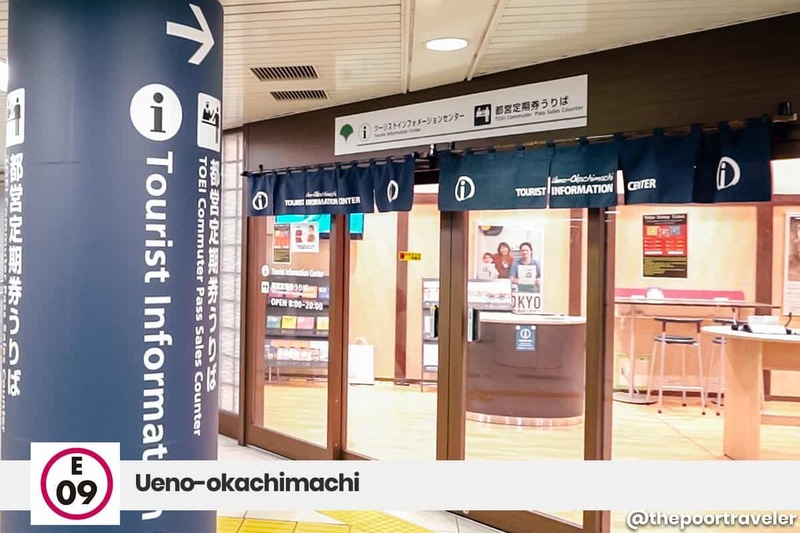 With the number of visitors increasing as the 2020 Tokyo Olympics and Paralympics approaches, Toei Transportation created tourist information centers to provide travel information to visitors. One of them is the Ueno-okachimachi Tourist Information Center. Grab some brochures and if you have questions, just ask away, because the staff here speak English, and even Chinese. They can help you with directions or recommendations on where to go. If you weren’t able to purchase a Tokyo Subway Ticket at the airport or before the trip, you can also get one here. Instead of boarding the train right away, make your way on foot to Ameyoko, which is located just around the corner. Ameyoko is a market street where you can shop for almost anything you can think of. A wide variety of products are sold here: bags, clothes, shoes, accessories, spices, fish. Don’t be surprised if you see barkers announcing discounts while standing on a chair amidst a sea of humanity. The street is also flanked with some eateries where you can have a quick meal. When you’re done, walk back to the Ueno-okachimachi Station, take the Toei Oedo Line to Kasuga, and transfer to Toei Mita Line to Onarimon Station. Emerging from the Onarimon Station, you’ll be greeted by the Zojoji Temple, the center of Chinzei Buddhism in the Kanto Region. This makes the stroll to the Tokyo Tower from the station a quiet and pleasant one. If you have more time, you can make a quick stop here too. But even from here, the commanding presence of the Tokyo Tower cannot be ignored, as it stands over the site. At almost 333 meters, the Tokyo Tower is the second tallest structure in Japan, next only to Tokyo Sky Tree. It is a communications tower that was built in 1958 and was inspired by the Eiffel Tower in Paris. Today, tourists are welcome to climb to the top observatory to enjoy magnificent views of the city. Admission Fees to the observation decks are ¥900 yen (main deck) and ¥2800 (both decks). However, because we will be visiting two more observation decks this trip, you may skip climbing and just admire the tower from below, which is FREE. Although you came from Onarimon Station, we’re using the Akabanebashi Station to get to our next destination. At Akabanebashi Station, take the Toei Oedo Line to Shiodome Station. Tokyo’s map is shaded by several parks and gardens, but the most famous ones can get too crowded especially in peak season. 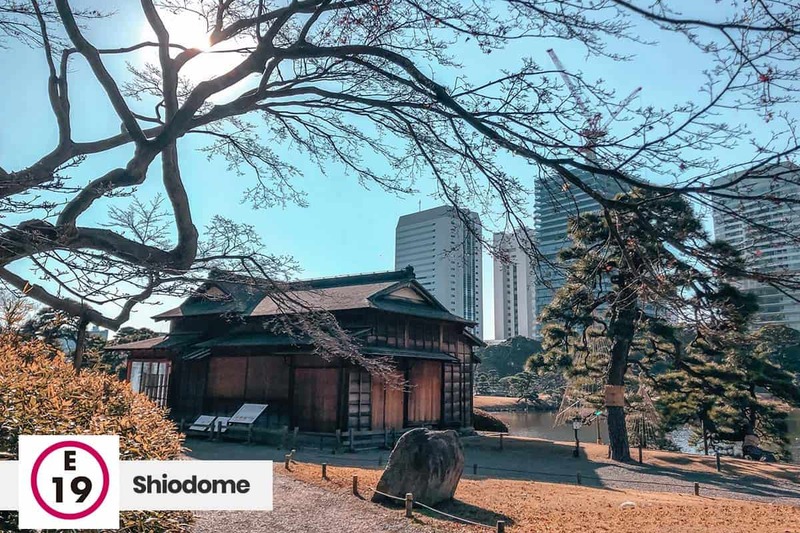 This is why Hamarikyu Gardens was so appealing to us: it remains the pocket of peace that it has always been, even in the middle of the bustling metropolis. Facing Tokyo Bay, Hamarikyu Gardens used to be where the villa of the Tokugawa clan stood back in the day. Today, it is a landscaped public garden adorned by trees surrounding a few ponds. At the center of the largest pond stands a teahouse, where you can enjoy Japanese tea and sweets. You can also admire plum blossoms if you visit in late February and cherry blossoms in late March or early April. After a moment of peace here at the gardens, it’s time for lunch! Our next stop is just a short walk away! Until 2018, the inner section of the Tsukiji Market was where Tokyo’s famous fish auction happens. It was the largest seafood market in the city. The main inner operation has since been moved to Toyosu, but the outer market remains alive and kicking. Several seafood restaurants and sushi bars continue to draw tourists from all over the world. This is also your lunch stop for today. You can pick any place that you like. 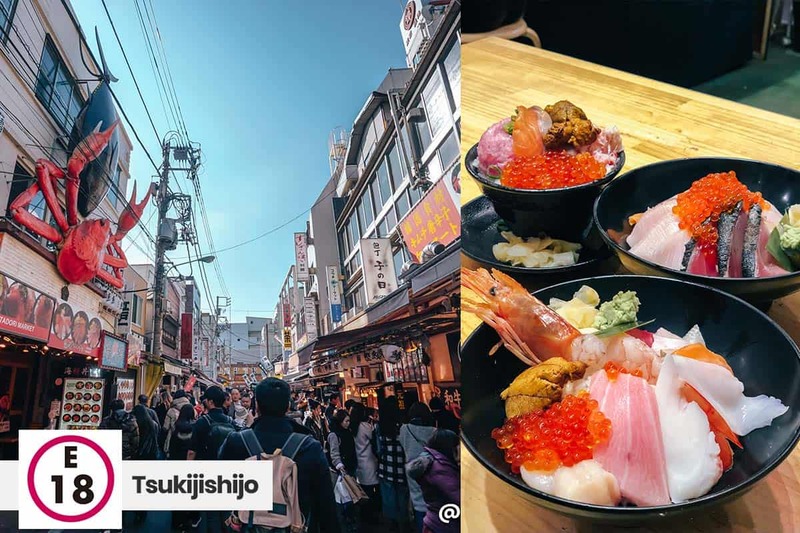 On our last trip, we decided to try Tsukiji Itadori Market, a seafood restaurant that is well-known for their kaisendon, a bowl of rice topped with assorted sashimi. There are over 15 bowls to choose from, including seared options if you’re not a fan of raw fish. The three best-sellers are the kaisen-don (Bowl 1, ¥1480), jo kaisen-don (bowl 2), and gouka itadori don. I decided to order Jo kaisen-don, which is a more premium version of their signature kaisen-don. The bowl included slices of medium fatty tuna, salmon, and octopus among others. But the main reason I chose this was the uni (sea urchin). Among other toppings were salmon roe, scallop, and a beautiful shrimp at the very center. Vins was more adventurous and let the chef decide the pieces on his bowl when he ordered Omakase sanchoku-don (Bowl 5). Omakase means “to leave it up to you,” and sanchoku means “straight from the source.” He was pretty delighted with the outcome. 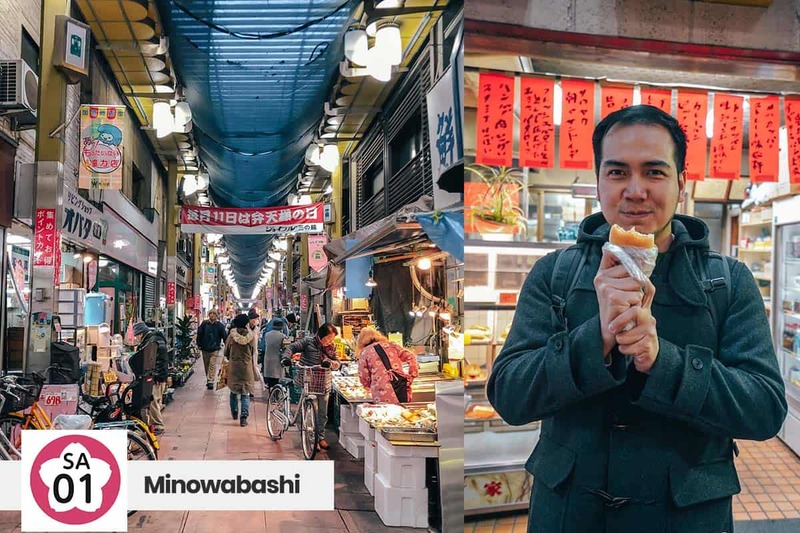 After a satisfying meal, we explored the rest of the outer market to check out what else we could enjoy as we made our way to Tsukijishijo Station. From there, we took the Toei Oedo Line to Tsukishima and switched to Tokyo Metro Yurakucho Line to Toyosu. 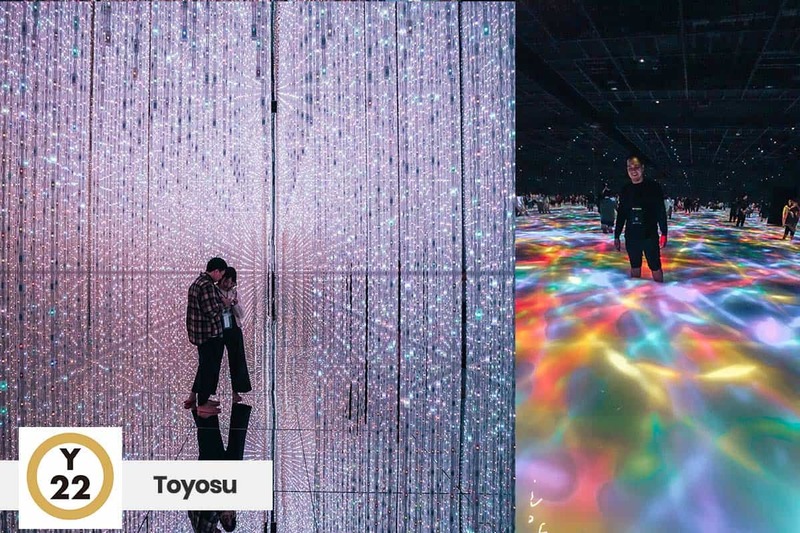 We’ve always wanted to experience teamLab since we first chanced upon a viral video on Facebook. Like the other incarnations, teamLab Planets is a digital art museum that tickles your senses. It’s body immersive so you can actually interact with the installations. Not to be confused with teamLab Borderless (which has more zones), teamLab Planets has only seven sections spanning over 10,000 square meters, which means more space to move around. We were quite surprised, too. We expected to see a room full of visitors, but it wasn’t as crowded as I imagined. One thing you need to know about teamLab Planets is that you will have to take off your shoes before entering because you will be wading in warm water at the very beginning and it gets knee-deep in some areas. Wear something knee-length or at least something you can roll up to the knees. The walls and even floors are made of mirrors, so make sure you don’t wear short skirts. But all these little preparations are worth it. The exhibits are so amazing, I had to hold my jaws to keep them from falling. After being treated to the sensory treat that was teamLab Planets, trace your steps back to Tsukishima Station and switch to Toei Oedo Line to Tochomae Station. Hours open: North Observatory, 9:30am-11pm; South Observatory, temporarily closed for renovations until spring 2019, otherwise it’s open from 9:30am-5:30pm. No, we’re not here to do an errand. 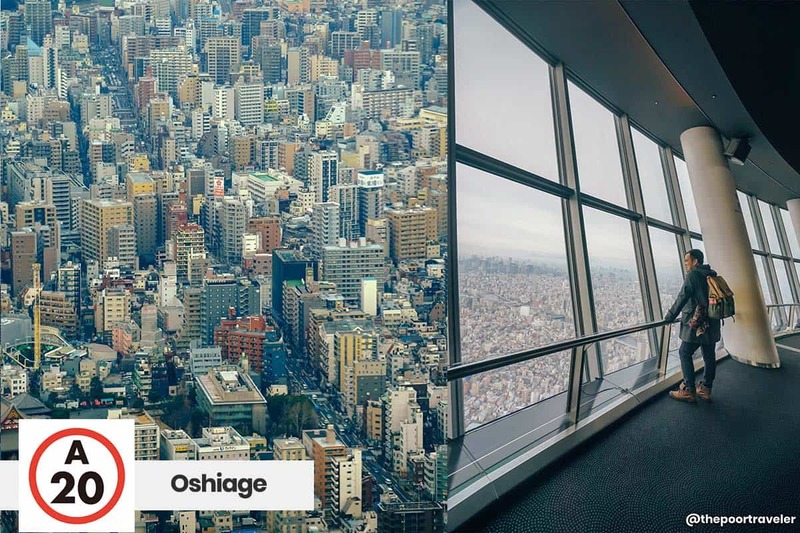 The Tokyo Metropolitan Government Building has FREE observation decks that allow some of the best vistas of the city. Because it’s free and there are only two elevators, expect to fall in line a bit, but the wait is worth it. From here you can see the Tokyo Tower and the Tokyo SkyTree! You can even see Mt. Fuji on a clear day. If you can make it before sunset, that would be super because you’ll get to enjoy the view in daytime, at twilight, and at night! Dinner time! 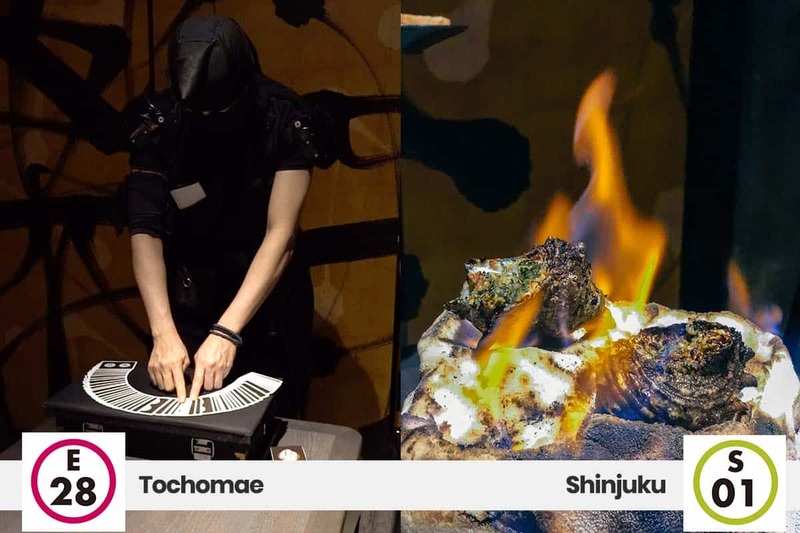 Tokyo has some of the most eccentric and sometimes downright strange dining places like maid cafés and robot restaurants. This time, though, we were able to try a restaurant run by ninjas! down to the dessert. All the smoke and mirrors were just a bonus for me. A typical meal costs ¥4000. 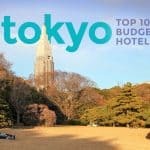 If that’s over your budget, you can choose another restaurant in Shinjuku area. You’ll never run out of options here! With that, DAY 1 comes to a close. From here, you can travel back to your hotel. If you’re staying near Ueno-okachimachi, you can simply take the Toei Oedo Line again. If your hotel is closer to a Toei Shinjuku Line Station, you may also walk to Shinjuku Station instead. For the second day, we decided to combine off-the-beaten-track attractions with the usual favorites. 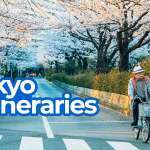 In the morning, you will be exploring the quiet and historical district of Arakawa City and Kita City. Arakawa City and Kita City are located in the northeastern part. 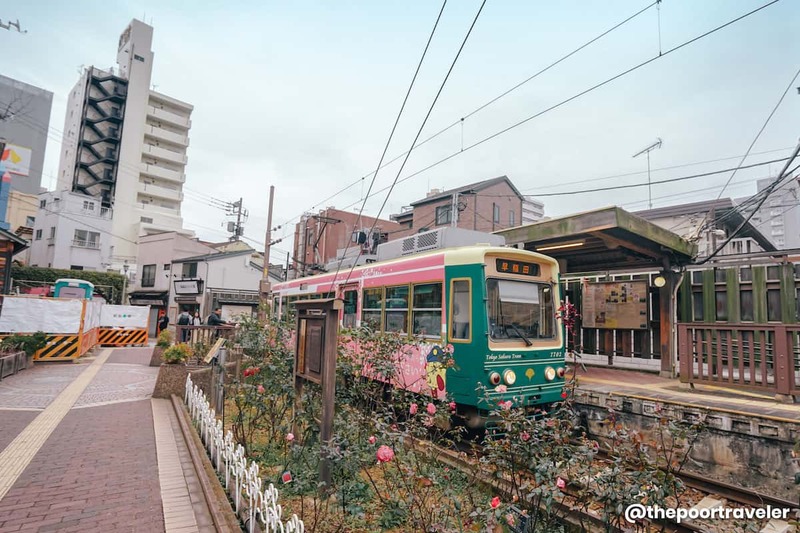 These areas are not as famous as Shibuya or Shinjuku, but still welcoming to tourists and harbor some of city’s best kept secrets, connected by the Tokyo Sakura Tram (Toden Arakawa Line). 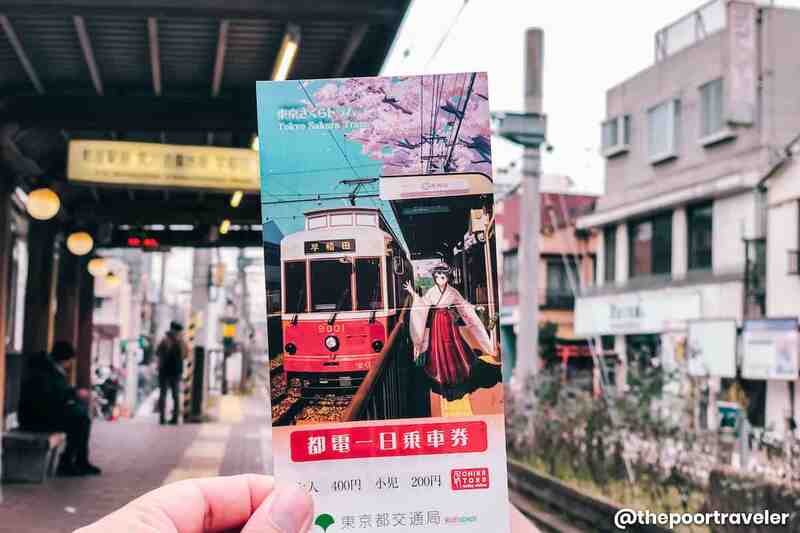 To save time and money, purchase a Toden One-day Pass, which will give you unlimited access to the Tokyo Sakura Tram the entire day. The staff will be scratching off a date on the back of the pass, which indicates its validity period. 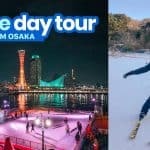 In the afternoon, you’ll be diving back into the futuristic side by visiting a couple of modern attractions before ending the day at one of the most visited sites in the city. You will need to use the Tokyo Subway Ticket again. As mentioned earlier, it’s always great to start the day at an information center just in case you have questions or need assistance. If your hotel is located in Ueno or elsewhere along any subway line, make your way to Minowa Station. From here, the Tokyo Sakura Tram is just a short walk from there. The Toei Transportation Information Center stands at the very beginning of the Tokyo Sakura Tram line. The center also serves as a mini-museum, where you can learn heaps about the past and present of Toei Transportation. You can also find some railway souvenirs here. Most importantly, you can purchase your Toden One-day Pass here, so you can use the tram much more conveniently. 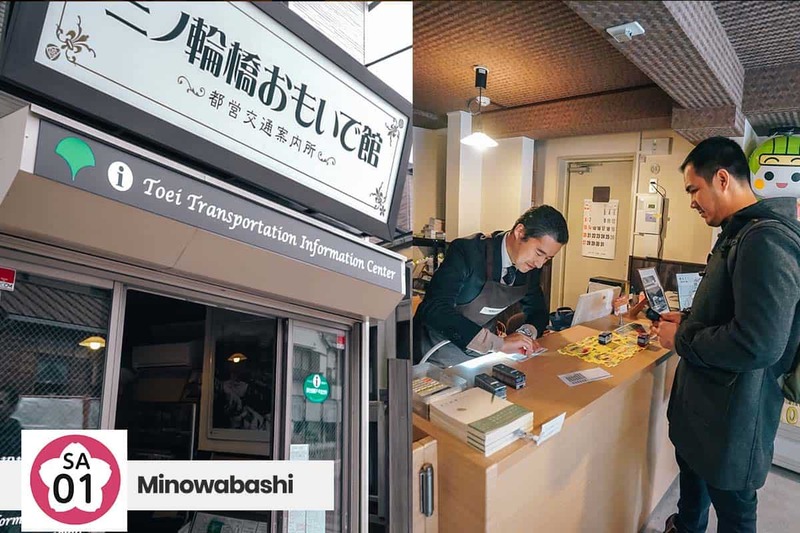 Before you get too excited hopping onto the Tokyo Sakura Tram, drop by Joyful Minowa Shopping Street, which is just a block away. Unlike most shopping arcades in Tokyo, Joyful Minowa is far from crowded. Most of the people you’ll see here are locals going about their day-to-day lives. If you haven’t had breakfast yet or craving some snacks, find a little bakery called Omura, the locals’ go-to place for pastries. Try their “kuroke” sandwich which is a sort of potato pancake in a bun, which costs only ¥150. Once done, trace your steps back to Minowabashi Station and wait for the next tram (streetcar). Trams work a bit differently from subways or trains. It’s much shorter and slower, and normally you pay right before you board. But with a Toden One-day Pass, you can just show your pass, the scratched off side, to the driver. A trip to Japan isn’t complete without a ramen experience! If you’re the type whose Japan dreams involve this immaculate noodle soup, you’re in for a treat. 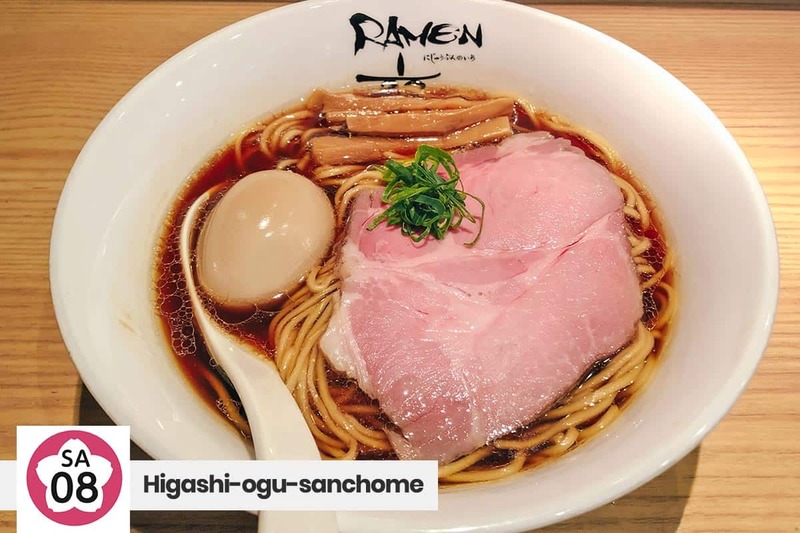 Ramen 1/20 is one of Tokyo’s best and has been featured on the Michelin Guide a couple of times. Vins ordered a bowl of their specialty, shio (salt) ramen, with mellow and subtle chicken-stock broth that is almost guilt-free. I had the shoyu variety, which although has bolder flavor still felt smooth and light. Each serving was plated cleanly but meticulously — a whole ajitama resting on the spoon and a slice of pink chashu. It’s definitely one of the best bowls I’ve had in Tokyo. Coming from Oji-ekimae Station, make your way on foot to the monorail entrance station and take the monorail to the park. In 1873, the Daijō-kan established a number of parks in Tokyo. Among them are Ueno Park, Asakusa Park, and Asukayama Park. While others have become crowd-favorites, Asukayama Park remain an oasis of calm in the middle of the city. During our visit, there was no one else in the park. We had it all to ourselves. You’ll also find a couple of well-preserved trains inside the park, just next to a children’s playground. It also has three museums: the Paper Museum, Asukayama Museum, and Shibusawa Memorial Museum. We visited in the middle of winter, so there wasn’t much color. But in spring, the park transforms into an unforgettable sakura destination. The park is covered with cherry trees, planted in the 18th century. 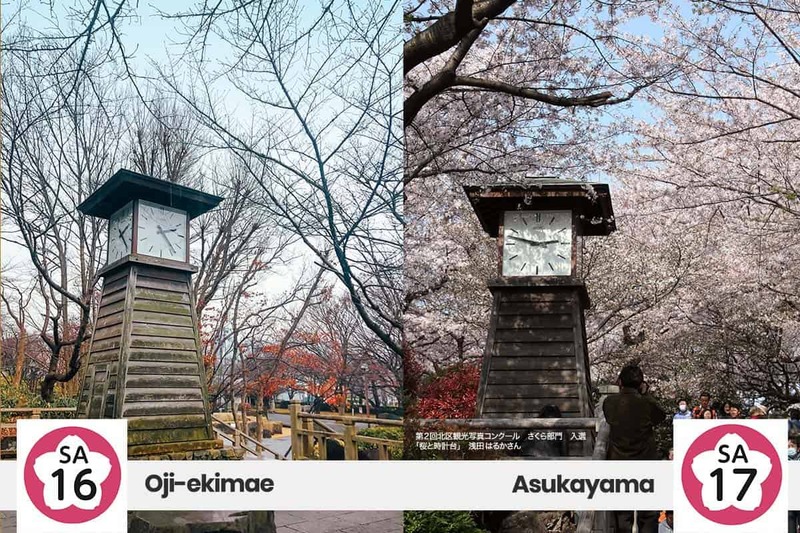 If you’re visiting in late March or early April, instead of going to the crowded Ueno Park, come to Asukayama Park instead and enjoy the cherry blossoms better. If you take the south exit, you’ll easily find the Asukayama Station. Head to it and wait for the tram that will take you back to Oji-ekimae Station. 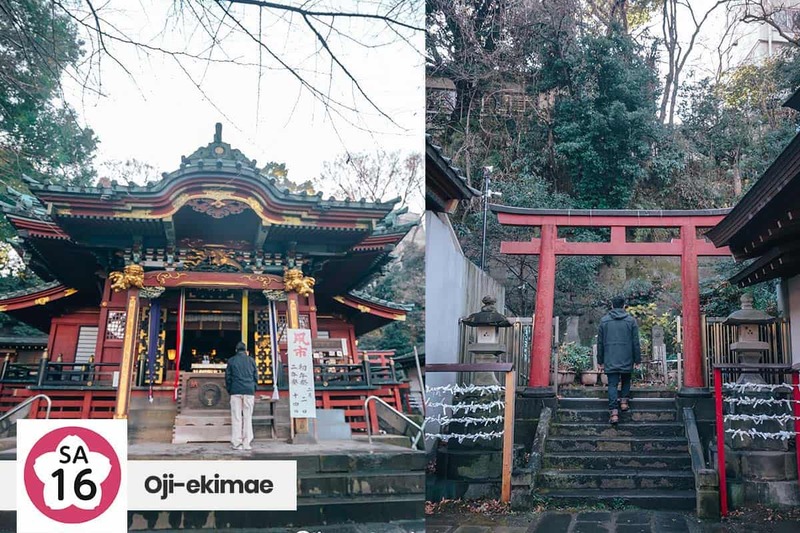 Just a 10-minute walk away from Oji-ekimae Station stands Oji Inari Shrine (not to be confused with Oji Shrine, which is also nearby). Oji Inari Shrine is a Shinto shrine built in 1822 and is where the famous Fox Parade takes place on New Year’s Eve. Next to the main temple is a short series of torii gates that will take you to a rock that is believed to be miraculous in a way. Legend has it that if you’re able to lift the rock from its place as you think of what you want to attain, that wish will come true. Otherwise, according to legend, that dream isn’t for you. Vins and I were able to carry the rock, though, so yay! 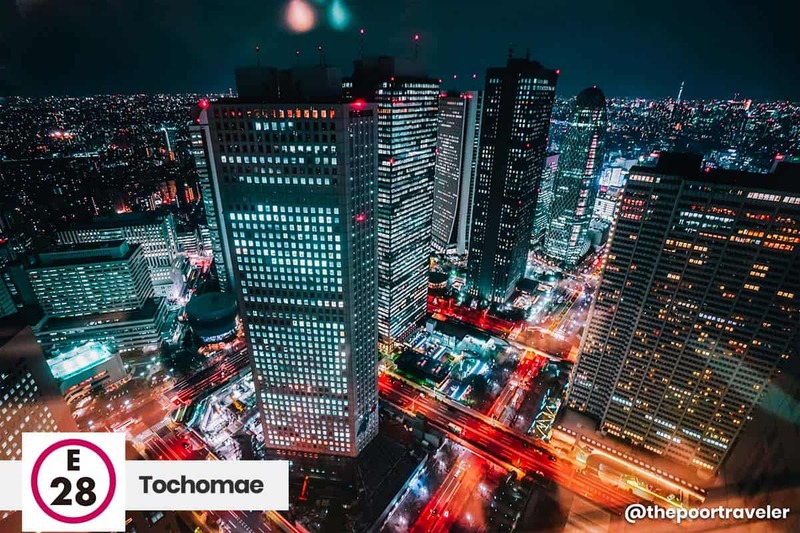 After you have your moment of peace and contemplation, make your way on foot to Oji Subway Station and take the Tokyo Metro Namboku Line to Ichigaya and then transfer to Toei Shinjuku Line to Iwamotocho. Akihabara is the otaku’s ultimate mecca and Tokyo’s quirkiest destination. 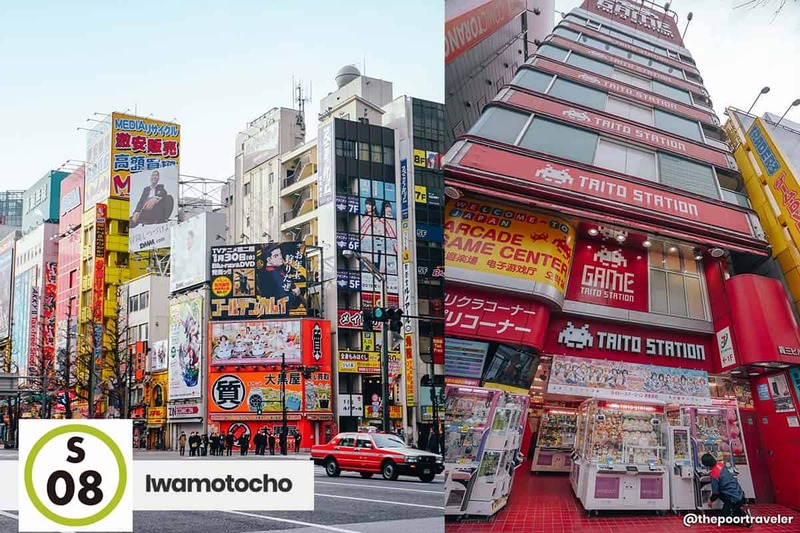 Here you’ll find several electronic stores, manga shops and cafes, maid cafes, Gundam Cafe, Tokyo Anime Center, and several arcade centers like Taito Station. We decided to spend some time trying to win a plushie at Taito Station. Although luck was not with us, we still had a great deal of fun. Afterwards, we walked to Yodobashi-Akiba, a massive store brimming with electronics and household appliances. 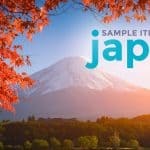 If you’re planning on shopping, don’t forget to bring your passport because you will need it to score the Tax-Free discount if your purchase is above ¥5000. 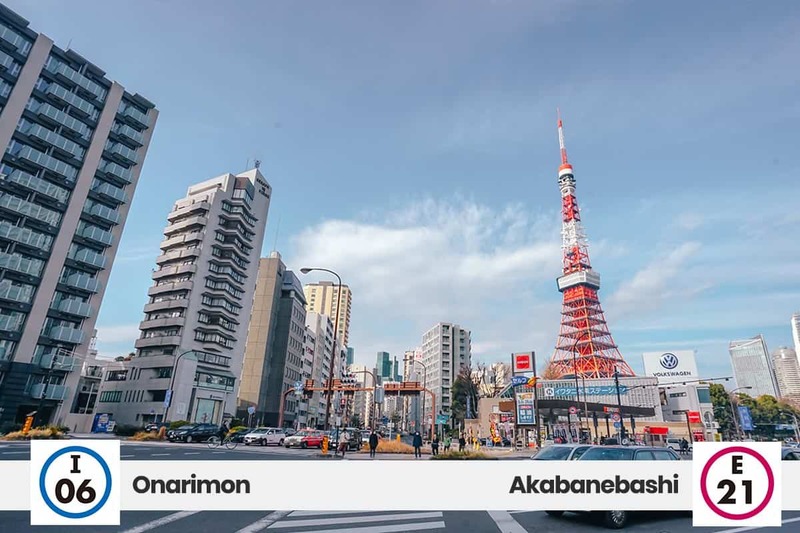 Instead of going back to Iwamotocho, walk to Akihabara Subway Station instead, which is nearer, and take the Tokyo Metro Hibiya Line to Ningyocho, then switch to Toei Asakusa Line to our next destination.  Clue: It’s gonna keep you looking up. Admission Fee: First observatory, ¥2060; Second observatory: additional ¥1030. The entrance to the tower is on the fourth level of SkyTree Town. If it’s packed and you didn’t make advance reservations, approach the staff by the entrance and they will usually assign a time slot. 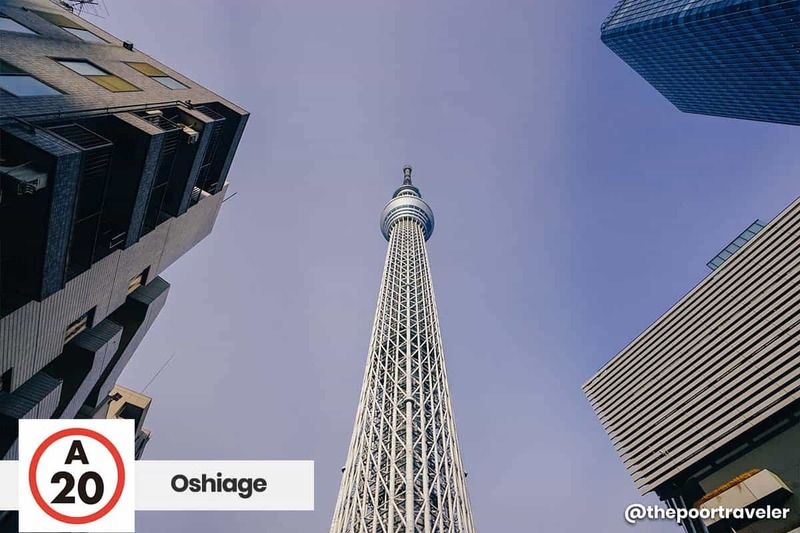 At 634 meters, this is Japan’s tallest structure. Suffice it to say that the panoramic view of the megalopolis from the top is nothing short of breathtaking. Again, if you can, visit just before dusk so you get to enjoy the view in daylight, at sunset, and at nightfall. Don’t forget to take photos as you move around the observatory. If you want something to remember this moment by, you can make a quick stop at the souvenir shop on the way out. From here, walk back to Oshiage Station and take the Toei Asakusa Line to Asakusa Station. 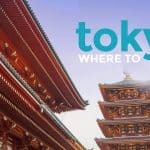 The Toei Asakusa Line is remarkable because it connects both Haneda Airport and Narita Airport to some of the city’s most popular attractions like Tokyo SkyTree and, of course, the Asakusa district. 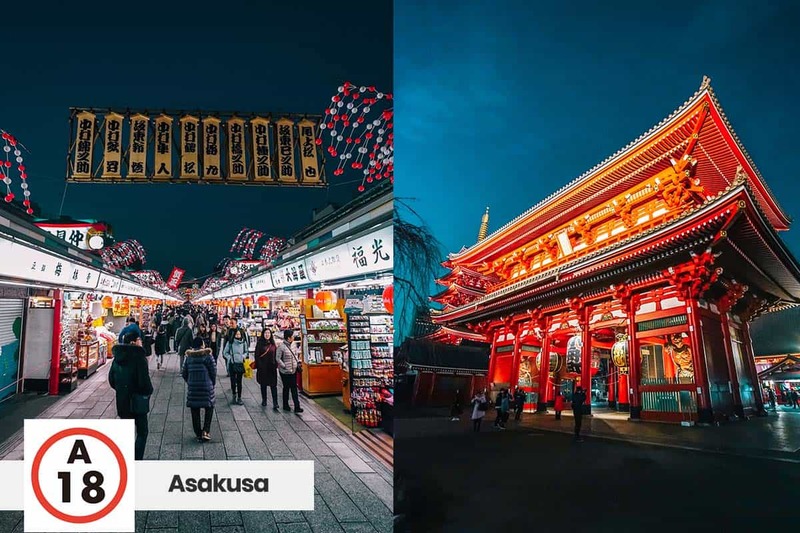 Asakusa is one of the most well-known neighborhoods in Tokyo primarily because of the iconic Sensoji temple. If you’re walking from Asakusa Station, the first structure that will greet you is the Kaminarimon (Kaminari Gate), constructed over 1000 years ago. From here, you’ll be walking down Nakamise-dori, a 250m long alley flanked with shops selling souvenirs and Japanese snacks. At the end you’ll find Sensoji, Tokyo’s oldest temple, built in 645 as a tribute to Kannon, the goddess of mercy. Because this is our second to the last stop, you can spend as much time as you want praying, admiring the architecture, trying out snacks, or shopping for souvenirs. You can also see the Tokyo Sky Tree from here! Of course, we’re not going to call it a day without dinner. This time around, we’re having tempura! I know you’re familiar with it because it’s also pretty popular outside Japan. But we’re not having tempura just anywhere. Since we’re already at an ancient site, we might as well have dinner somewhere that has a bit of history – Daikokuya. Daikokuya is a highly-regarded restaurant has been serving tempura since 1887. Yep, it’s over 130 years old! 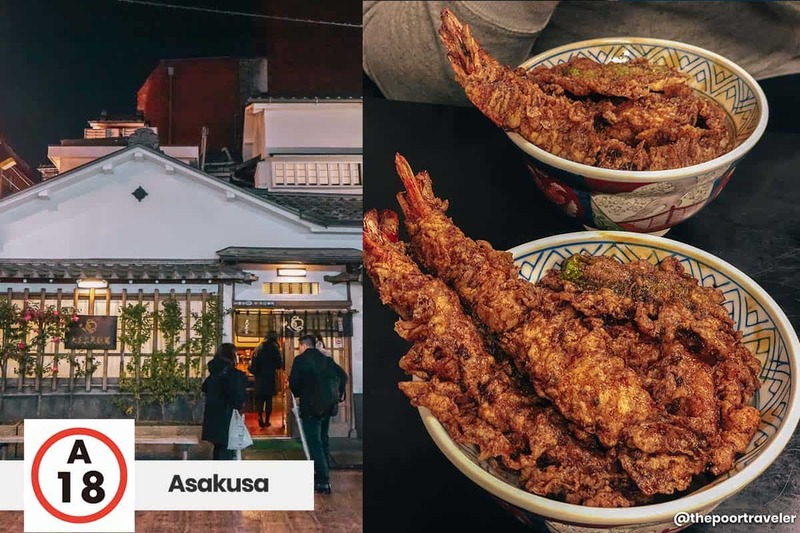 Their signature dish is tendon, basically a bowl of rice crowned with battered prawns that are deep-fried. It’s often served with other types of seafood and vegetable tempura. One thing I instantly noticed was how different it looked. The tempura that I’m used to has batter that is light in weight and color. Daikokuya’s is a bit darker, close to golden brown, but absolutely more packed with flavor. It’s also a lot crispier, complementing the soft, soft rice that it hides underneath. Price starts at ¥1550. After the meal, you can make your way back to your hotel. 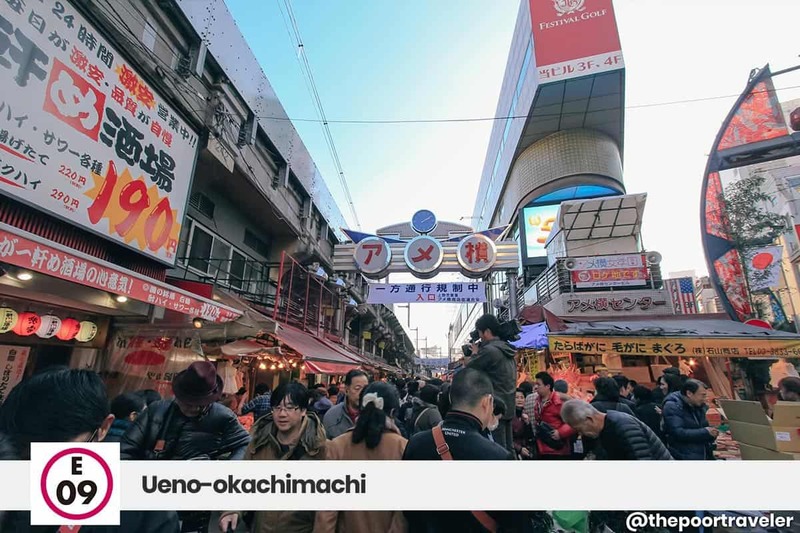 If you’re staying near Ueno-okachimachi, you can take the Toei Asakusa Line to Kuramae, then transfer to Toei Oedo Line to Ueno-okachimachi Station. 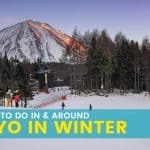 If you follow the above itinerary, you will be spending only ¥1600 on transportation (¥1200 for the 48-hour Tokyo Subway Ticket and ¥400 for the Toden One-day Pass). Without these passes, you would have spent ¥2900. That’s a total of ¥1390 savings! Not to mention all the time that you saved by not falling in line or trying to purchase a ticket each time you’re gonna use the train or tram. Including all the entrance fees and meal expenses, prepare to shell out around ¥15,000 (PHP 7180, USD 138, SGD 185), excluding airfare, accommodations, visa fee, travel tax, and shopping budget. Note, however, that the biggest chunk of the budget went to Ninja Shinjuku on Night 1. If you’re not interested to spend that much on dinner, you can just eat elsewhere for less than ¥1000. That brings down the total cost to only ¥12,000 (PHP 5800, USD 110, SGD 149), excluding airfare, accommodations, visa fee, travel tax, and shopping budget. Now that’s pretty low considering that we have visited over 15 attractions including three top-notch restaurants! 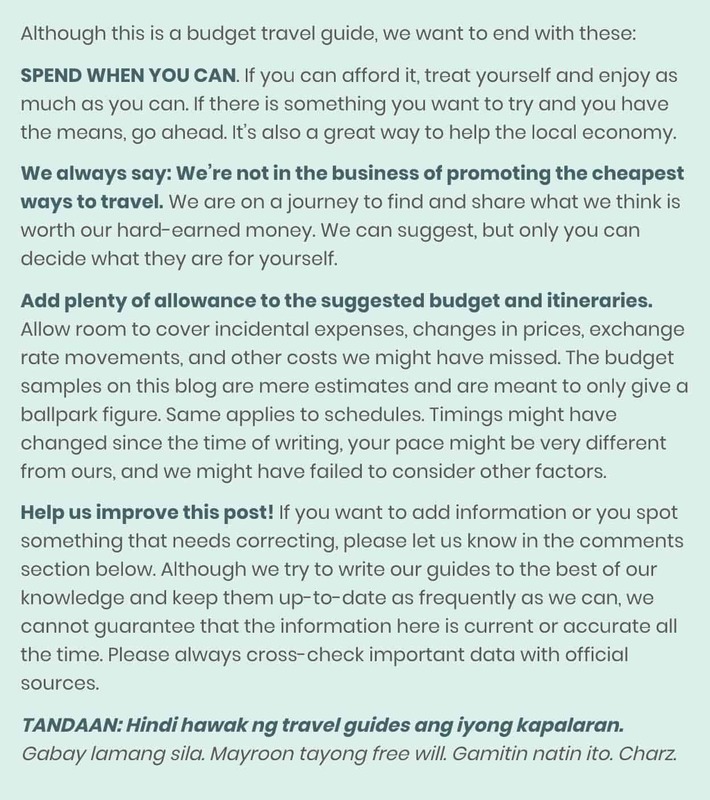 Feel free to customize this itinerary according to your preferences. 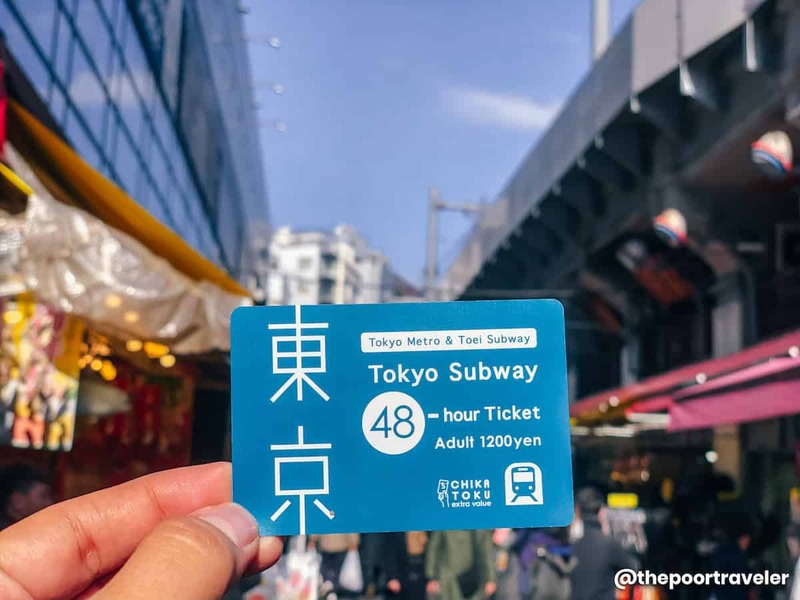 To ensure savings and maximize your Tokyo Subway Ticket, try to find the nearest subway station to the attraction you want to visit! That’s all for now. Watch out for more posts from our Tokyo trip soon!